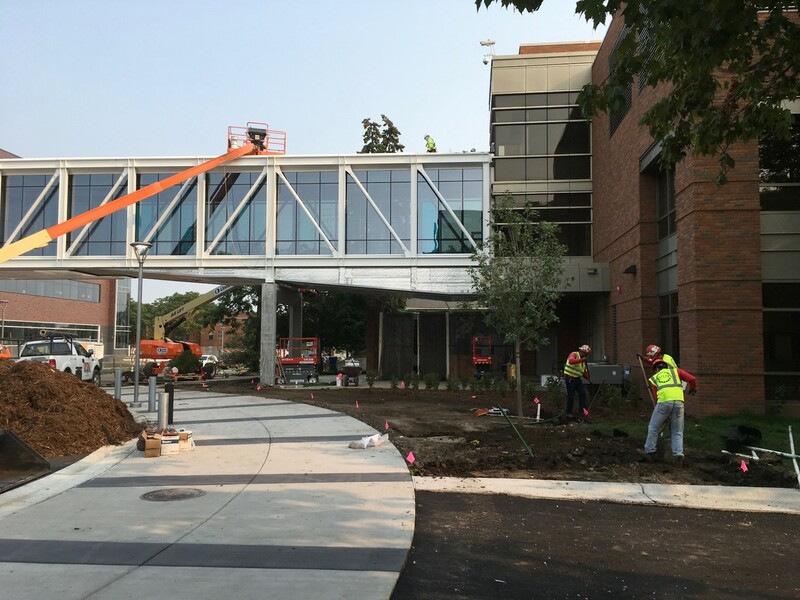 Following the Labor Day weekend, construction crews continue with exterior and interior work on the Hagfors Center. Roundabout. 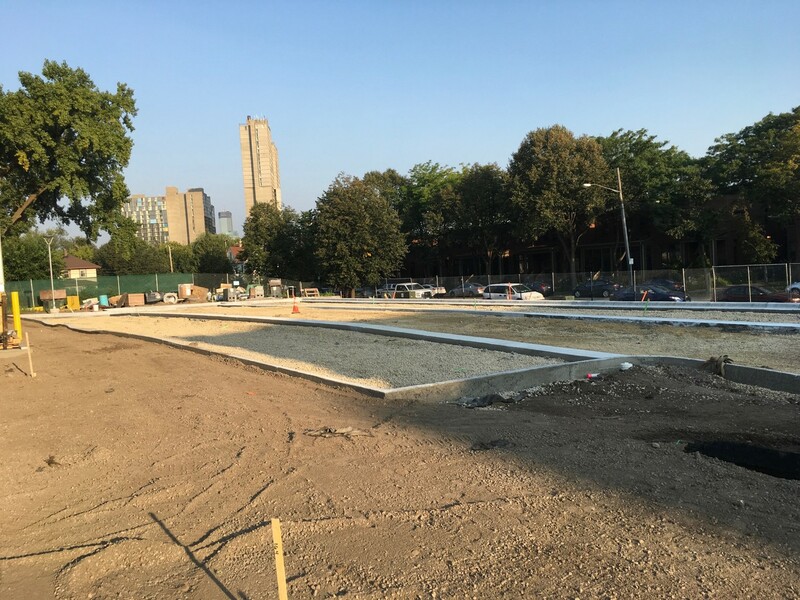 With the roundabout at the intersection of South 7th Street and 21st Avenue South set to open to pedestrian and vehicular traffic this week, crews will continue landscaping on the east and south sides of the intersection (see photo above). Once the roundabout is open, some work will still need to be completed in the area, which may affect parking near the roundabout and skyway. McGough Construction will work close with Augsburg to coordinate any related any related parking impacts. New sidewalk. 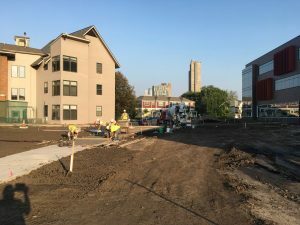 A new sidewalk now runs between the Hagfors Center and Luther Hall, connecting 20th Avenue South and 21st Avenue South (see photo below). 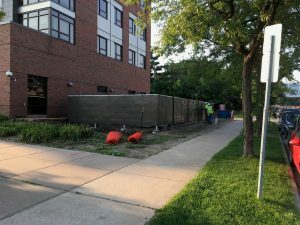 The sidewalk is within the construction site, so is currently not open for use, but once the building is complete, this new pathway will create an east-to-west connection for pedestrians crossing campus. North parking lot. 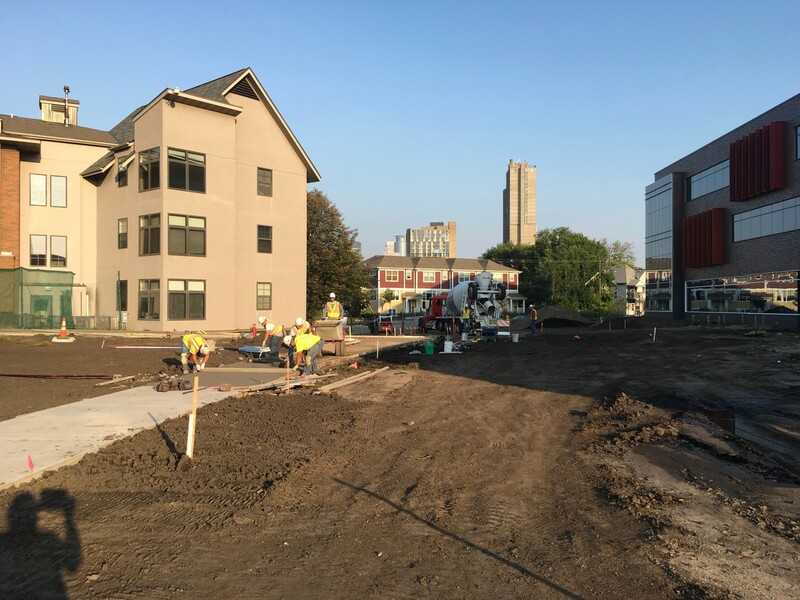 The parking lot north of the building is ready for asphalt installation this week — a portion of which will be porous asphalt that allows rainwater to filter through it, which is part of the plans to qualify the Hagfors Center for silver LEED certification. 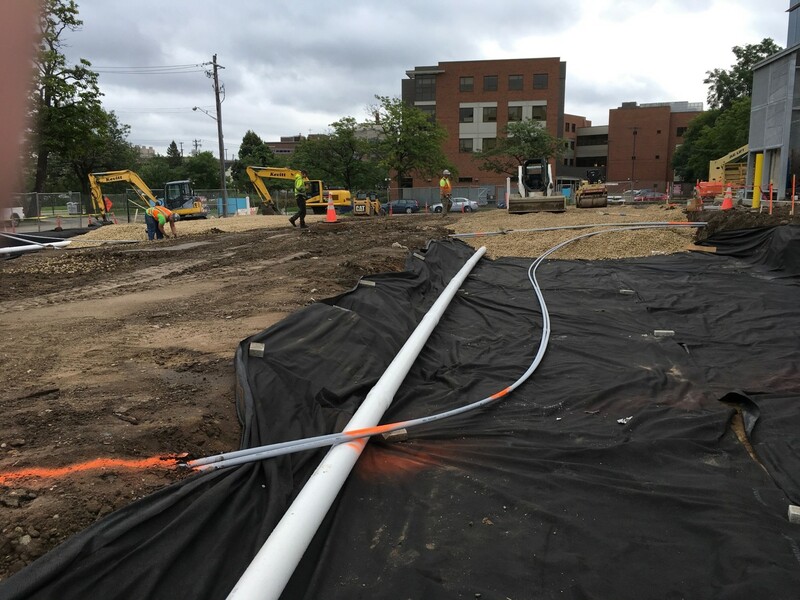 Crews previously ran electrical conduit below the lot surface and prepared the area for proper drainage (see photo at left), then installed curb and gutter and graded the lot (see photo at right). Electrical and drainage work beneath the north parking lot. Curb and gutter in place on the north parking lot. West side of Oren Gateway. Installation of the steel structure and decorative metal panel around the utilities area on the west side of Oren Gateway will be substantially completed this week. Crews will also complete landscaping around the screen wall this week. Screen wall west of Oren Gateway Center. Interior work. Crews are beginning window shade installation this week. Completion of other interior work is now focused on the 3rd floor of the building, while final quality control checklists are beginning to be reviewed on the lower floors. Additional sidewalk and bike lane closure. 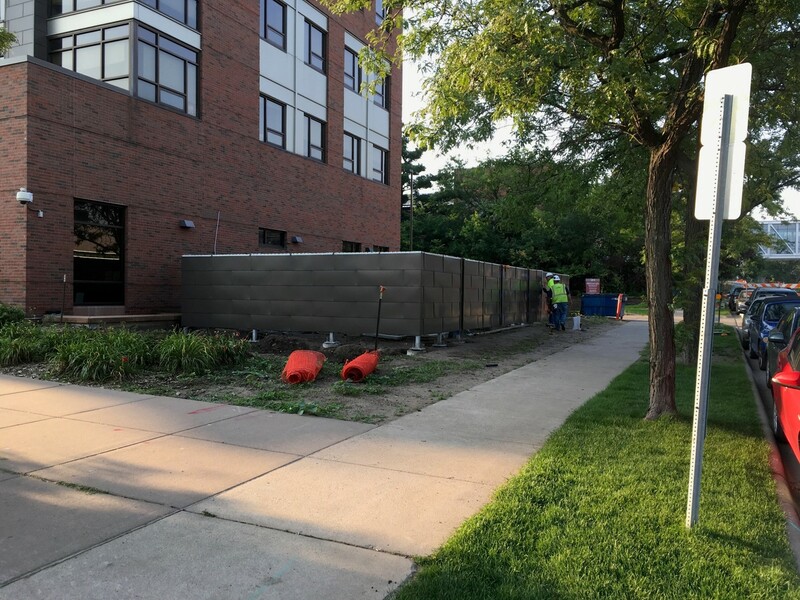 The sidewalk and bike lane on 20th Avenue South have been re-opened but will require another closing at some point after this week to complete concrete curb and sidewalk work around the construction site. 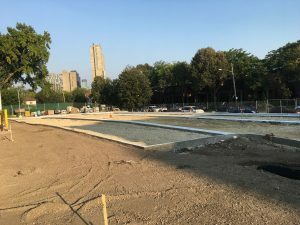 McGough Construction is coordinating with the City of Minneapolis on the timing of the closure. Watch for posted signs indicating closures in that area.